Kia's mini-MPV concept car revealed | What Car? Here is the first full picture of Kia's No 3 concept car that will be revealed at next month's Geneva motor show. Previously codenamed YN, the No 3 has an extended windscreen and a panoramic glass roof, plus an automatic sun visor. 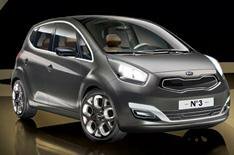 Other features include the new face of Kia, with the front grille, headlamps and brand logo set in a new arrangement. Kia's No 3 is smaller than a Cee'd, is based on the same platform as the forthcoming Soul, and set to rival Vauxhall's Meriva MPV. It is the first Kia to be designed from conception by Peter Schreyer, who formerly worked for Audi, and was responsible for designing the original TT. The No 3 should make it into production early in 2010.